Childhood BFFs Laura and Lillian (and both Harvard alumni, may we add) noticed there was a white space in the wellness industry when every beauty brand seemed to be focused on removing body hair, not taking care of it. They were clearly onto something because their line of grooming products, appropriately named Fur, has been featured in numerous publications, on shelves at over 300 retailers, and even gained the approval of Emma Watson since its launch in 2016. Besides running her own company with her friend, Laura has perfected a morning schedule that keeps both her wellness routine and haircare intact. Keep reading to learn more about how this co-founder starts her day, including her favorite activewear and skincare products. This is technically when I "wake up,” but I have to admit that I am a chronic snoozer. I respect people who can wake up on the first try! I finally drag myself out of bed because I scheduled Pilates. I like to book myself morning activities to incentivize me to get up on time. If I have time, I’ll also brew a little coffee. I drink coffee throughout the day, but often I don’t get my first cup until I’m at the office. I get dressed in the Outdoor Voices FreeForm Bralette and a Live the Process Corset Bodysuit. The new Outdoor Voices collection has a cool chartreuse colorway, and I’ve been loving the support and breathability of that bra combined with how soft and flexible the bodysuit is. For Pilates, you really need gear that’s comfortable and easy to stretch in, so I tend to shy away from a compression fit. I love going to Shona at Sapphire Pilates! She’s a great coach and has helped me get more flexible despite a few back injuries over the years. Immediately after Pilates, I’ll quickly wipe away the sweat and debris with Fur’s Wash Cloth. I plan on showering when I get home, but it feels nice to get a little refresh first. 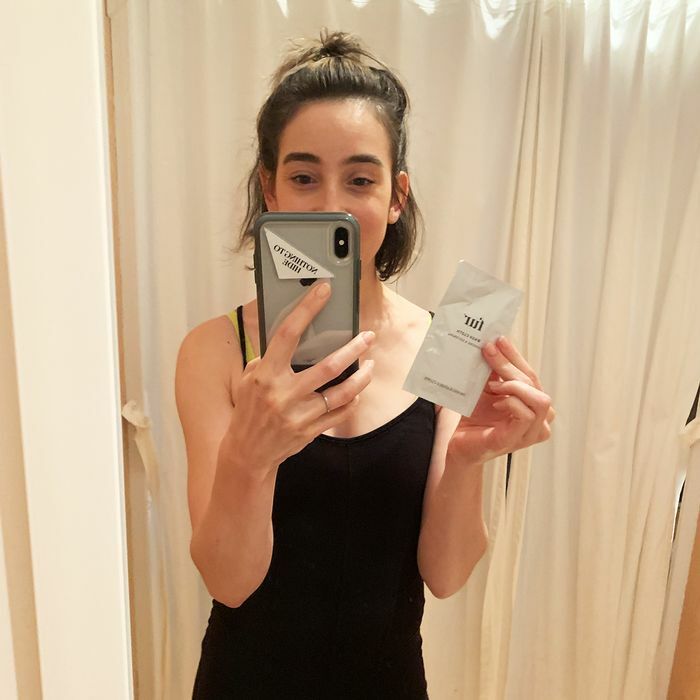 It also has lactobacillus ferment in it, which is a probiotic that helps promote collagen growth while removing bacteria—so not only am I rejuvenated, but I’m also giving my skin a boost. Once I’m home, I hop in the shower and start my skincare and haircare routines. Now that I have a toddler, this routine has gotten way more efficient than it used to be. In the shower, I use Fur’s Silk Scrub all over my body to get my pores clear so that my skin can absorb products better. I follow that with Barbara Sturm’s enzyme cleanser on my face, and then I’m out. After I’m out of the shower, I start my skincare routine. I finally gave into the hype and bought the Vintner’s Daughter Essence and Serum combo. It’s expensive but also seems to work pretty well at evening out my skin tone and keeping away winter dryness. I’m a huge fan of mists and essences—Tatcha, Savar, and Avéne are all great options at different price points. I follow up with a little of Fur’s Ingrown Concentrate on this patch of eczema right under my lip in the hopes that the tamanu nut oil in the formula will help speed up the healing process. I then follow with Fur Oil all over my body to lock in moisture and prevent any ingrowns or razor burn! Haircare is super easy for me because I don’t brush my hair much, so I can quickly get dressed and head out the door for another crazy day of work, either at the Wing Soho or at Fur HQ.